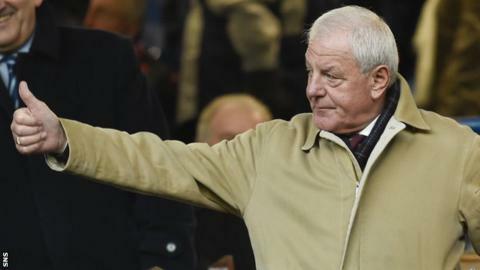 Scotland manager: Is 'Send for Walter Smith' the right battle-cry for SFA? A few years back, Stuart McCall was in the BBC Scotland studios doing one of those 'This Is Your Life' interviews, an in-depth revisiting of his career, from Bradford to Everton and onwards to the glory years at Rangers. He spoke in reverential tones about his manager at Ibrox, a figure he saw as a colossus, a mentor he referred to only as "Sir Walter..."
McCall mentioned the influence of "Sir Walter" about half a dozen times before somebody mentioned to him that Walter Smith wasn't actually a Sir at all, that he'd never got the nod. McCall looked astonished. "Really? I presumed he had been!" No matter. About three more times in the interview, McCall referred to Smith as Sir Walter; an arbitrary knighthood from the House of Stuart. What issues will face new SFA chief? Throughout his years as one of Scottish football's towering managerial forces, there was an in-joke in the media about Smith's capacity to solve any problem. Melting polar ice caps? Walter would have it sorted in an hour. Oceanic dead zones? A 10-minute job. Deforestation? Pollution? The global extinction of wild animals? Just one of the great man's famous stares and it would be taken care of. 'Send for Walter!' became the battle-cry for an age. Hearing it being trumpeted again this week, seven years after he retired from football management, was surreal. Hearing that Smith might seriously consider coming out of his carefree existence to manage Scotland for a second time was weirder still. In the Scottish FA's pursuit of a new manager, some odd things are going on right now. The association looked to have gone from veteran (Strachan) to younger gun (Michael O'Neill) and back to veteran (Smith). They have gone from a proposed four-year deal for O'Neill to, if the leaks are true, a short-term deal for Smith, who wants to put this business to bed soon, one way or another. The SFA was prepared to let O'Neill pick his own back-up team - he would have asked Steve Clarke and Austin MacPhee to join him part-time - but it now seems that the board, or some on the board, at Hampden are sweet on succession planning, thereby imposing caveats on who the new manager can appoint to his backroom. Smith, you sense, would have zero time for that. The SFA discounted Malky Mackay as a possible manager a few months back but now, it would appear, Mackay is under consideration after all. That means that not only is the SFA now looking for a chief executive and a manager, but they might also be in the market for yet another performance director as well should Mackay be elevated. If the SFA, principally the recruitment panel of Alan McRae, Rod Petrie and Ian Maxwell, has a joined-up strategy then it's hard to see it. Why, for instance, are they countenancing the appointment of a manager before the appointment of a chief executive? Should it not be the other way around? Shouldn't the chief executive play the key role in appointing the manager, not have one thrust upon him? On the Smith issue, there are myriad things to consider. Firstly, there is the puzzler as to why he would want it. This is a man who looks to be having a dream retirement, part of it spent travelling the world, part of it spent in Scotland watching his beloved grandchildren growing up. Why complicate things? Yes, there are a lot of Scottish players out there. Yes, in the hands of a quality operator, qualification for a major championship should not be beyond them. Yes, again, the salary is around £500,000 for a part-time job. Nice work if you can get it. It's still far from clear whether Smith actually wants it. Observing the shenanigans at Hampden might make him less enthused about the whole thing. His age has been used as a negative against him being offered the job. There will be 11 managers in their 60s at the World Cup this summer. Oscar Tabarez, manager of Uruguay, will be 71 by the time Russia comes along. Jupp Heynckes was 72 when he returned to Bayern Munich this season. Age is not so much of a big deal. The fact that Smith has been retired for seven years is more relevant. One argument has it that no man, no matter how impressive he may have been, can spend that amount of time away from the game and hope to successfully parachute back in. His supporters will say that this is Walter we're talking about. He's different. Something else. Elements of the Tartan Army will never forgive him for dropping Scotland for Rangers in 2007. The national team were in the midst of a murderously difficult Euro 2008 qualifying campaign when he exited. The actual departure was controversial, but understandable at the same time. Rangers, the club he adored, needed him after the dog-days of Paul Le Guen. He answered the call. Some got it, some didn't. Is it all that relevant all these years later? Not really. What is grim about all of this, though, is the lack of vision. One knock-back from O'Neill and the SFA lurches across the managerial spectrum to almost the opposite to O'Neill. A few weeks ago they wanted a certain type of manager and now they're contacting a wholly different type of manager. It's as if, after the shellacking they received for missing out on the Northern Irishman, they panicked, pulled the emergency chord and sent for Walter. Do they want him because they're convinced he's the man to take Scotland forward or do they want him, in part at any rate, because they're convinced he's the man that would prove most popular with the media, the popular choice to get the press off their backs? There's no doubt that McRae and Petrie have been feeling the heat. Regan was the human punch bag for the longest time, but since he was bulleted, the other two have come more sharply into focus and their own performance has been questioned. So much stuff is coming out of Hampden that it's difficult to know what they are going to do next. Right now, confusion reigns and nobody rules.